M61 is a grand design barred spiral galaxy about 50,000 light years from us. Grand design spiral galaxies have 2 or more distinct spiral arms, and barred spiral galaxies have a longitudinal bar across the nucleus of the galaxy. While M61 is one of the largest galaxies in the Virgo Cluster, its apparent diameter in the sky if fairly small - about 6 arc minutes (or 1/5 the diameter of the full moon). Also featured in this image are 2 companion galaxies to M61. NGC 4301 is a barred spiral galaxy to the upper left of M61. 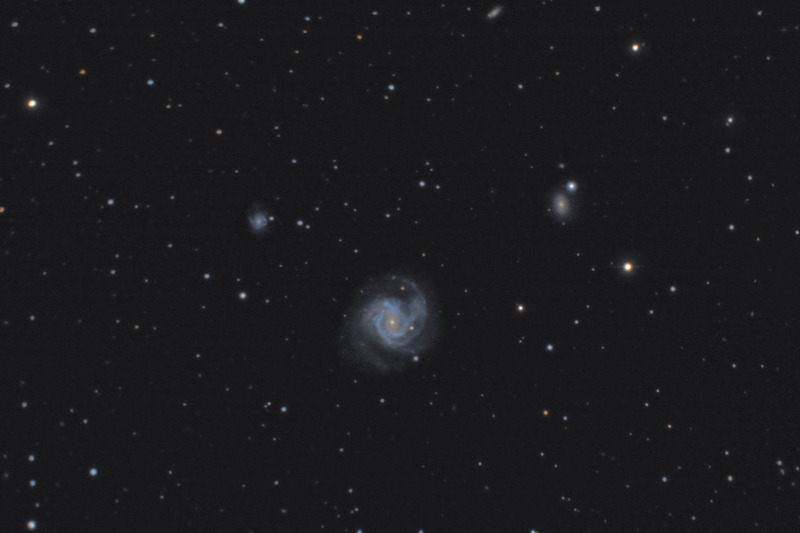 NGC 4292 is yet another barred spiral galaxy to the upper right of M61 and has a satellite galaxy just above it. The galaxy at the very top of the image is UGC 7411, and there are a number of faint galaxies scattered throughout the image. In this image, North is Up. This image is cropped to 73% of the original full frame. Software Used Images Plus 4.0 for camera control, calibration, stacking and digital development and multiresolution smoothing. Photoshop CS5 used for flat fielding, levels and curves, color balance, high pass filter, star shrinking, saturation adjustments, and noise reduction. Carboni Tools for additional saturation adjustments and noise reduction. HLVG used for additional color correction. Notes I took this astrophoto before I had upgraded my mount for autoguiding. As such, the subexposures are only 45 seconds. While the image is far from optimal, I was glad that I was able to pull out a surprising amount of faint detail in the galaxy and surrounding field.